Set in Kodaikanal, just 601 meters from Chettiar Park. Chettiar is a small park which is managed by the Kodaikanal Township and offers a calm and soothing environment to its tourists. Covered with lush greenery and exquisite scenic views all around, this place is worth spending your time at with your loved ones. A wide range of beautiful flowering plants too can be spotted in the garden with the main attraction being the Kurinji Flowers which bloom once every 12 years and create a distinctive purple haze everywhere. Last, the flower bloomed in 2004. The park comprises of floors which have been decorated with flowers in the park and the lush green lawns. The park has also been a prominent place where many commercial films have been shot which explains the beauty of the site. Situated 3 km away from the Kodaikanal bus stand, the park has been constructed on the hillside and is one of the most captivating parks owing to the rare species of plants that it contains. This small scenic area boasts of natural beauty and a peaceful environment which leaves a strong message to all the nature lovers out there. Also, the bushes designed in various ways and walkways around are going to give you a good time. The diverse garden is a place which can be visited during summers and has a commanding area where you can spend your days appreciating its beauty. The garden falls on the way while travelling to the Kurunji Andavar Temple and due to its beauty and religious consecration, the place is considered to be a tourism hotspot. The nature lovers often come here to enjoy the serenity of the area with the purple bloom and the Kurunji flowers being the main attraction here besides the wide varieties of blooms on exhibition. 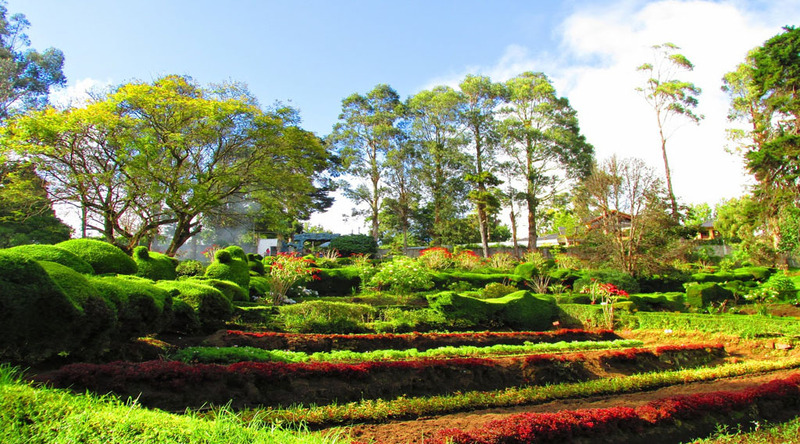 Chettiar Park is a silent but a very pleasing tourist destination in Kodaikanal and should not be missed out on especially if you are planning a trip to this place. You can sit here and enjoy the serenity amidst the natural beauty which is going to help you break away from the din of daily life. The Peak Resorts, Kodaikanal, is a hill resort situated in one of the most scenic places in Tamil Nadu, offering an enchanting view of Kodaikanal with valleys and beautiful greenery all around. The Peak Resorts are made from a beautifully restored Chettinad Palace with additional modern rooms built into the adjoining hillside. The Peak Resorts offers star class accommodation, with excellent facilities. The Peak Resorts, an ultimate destination for a holiday in the hills. It is an ideal weekend and a romantic getaway. The Peak Resorts also offers excellent facilities for residential conferences, dinners and outdoor bonfires and trekking for groups. We look forward to hosting you and your loved ones for an exceptional stay with us enjoying our excellent facilities and exploring the beautiful environment and amazing places of interest all around Kodaikanal.